During our trip to Berlin with Scoot, we took a day trip to Potsdam which is located just a short 30-minute S-Bahn train ride away from Berlin.What I like about travelling to Berlin is that you don’t have to spend a lot of time travelling around e.g. after arriving at Berlin Tegel airport from Singapore with Scoot, you can reach the Berlin city centre within 20 minutes and most of the sights in Berlin are accessible by U-Bahn or S-Bahn or buses within 10 to 15 minutes! If you have been to Amsterdam, you may find that the houses in the Dutch Quarter (or Holländisches Viertel) look very familiar like the canal houses in Amsterdam. The Dutch Quarter was built in the early 18th century by Dutch immigrants recruited to develop the swampy grounds of Potsdam. Today, many of these buildings are cafes, restaurants and shops, making it a lovely place to start your trip within Potsdam city centre. You may have heard about this bridge from the Tom Hanks movie with the same name “Bridge of Spies”. This bridge is actually used for prisoner exchanges during the Cold War. Over 40 people were exchanged on this bridge between East and West Germany. In the picture below, we are standing on the West Berlin side and the other side then-East Germany. The bridge is of a darker green color on the West Berlin side and you can see the transition to a lighter green color in the middle of the bridge! To reach the Bridge of Spies, you will either need to drive or go on a Hop On Hop Off bus tour which brings you to several of the sights that I will be referring to in this post. 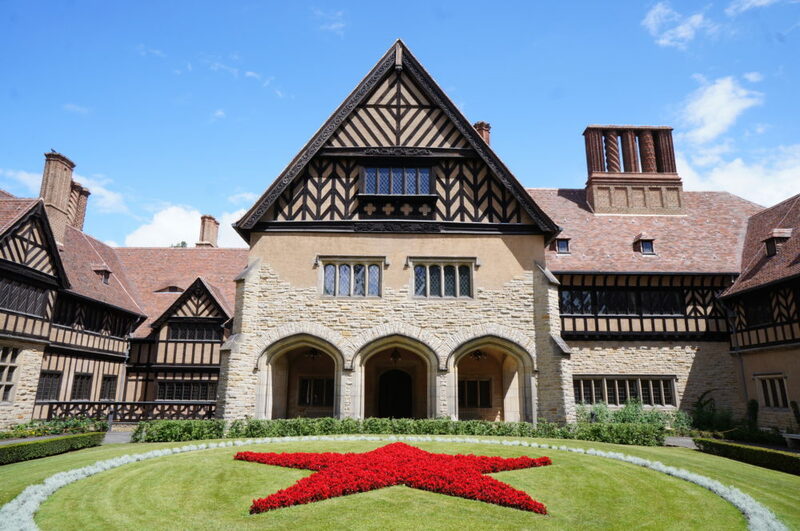 The Cecilienhof Palace is where the Potsdam conference was held between USA, UK and Soviet Union to decide on the fate of postwar Germany – because the Soviets organised this conference, they planted a giant red star in the lawn. Other sights that you should not miss in Potsdam include the Filmpark Babelsberg which is one of the oldest and largest film studios in the world and is responsible for some of the blockbuster movies e.g. Valkyrie, V for Vendetta, The Grand Budapest Hotel, Inglourious Basterds. The Filmpark is located outside of Potsdam city centre and you can access the Filmpark via the hop on hop off bus Hop off at Bus Stop 3 to learn all about the history and culture of the Germany cinema. Potsdam also had a small Russian colony dating back to the 1820s – the Alexandrowka comprises a dozen quaint buildings; these buildings will provide you with a glimpse of Russian culture and architectural style back in those days.